to the things that dry your skin. The moisture, beauty and softness of your skin is constantly attacked by both natural and artificial factors in the environment. Sun, wind, cold or hot and dry air. Water, soaps, shampoos and anti­bacterial products. Chemicals in cosmetics, frangrances, gardening and household products. These break down skin's natural protections. They strip away moisture and oils leaving skin dry and irritated. Shielding lotion duplicates and enhances the skin's protective barrier. 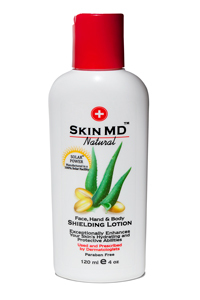 Just a small application of Skin MD Natural daily protects skin from damage and delivers hours of soothing moisture. In fact, the humectants in Skin MD Natural are 6 times more effective than those typically used. You can replace all you old moisturizes with Skin MD. 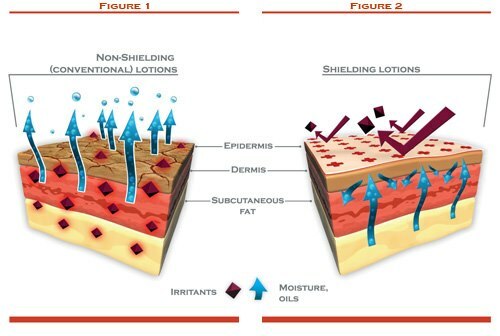 Skin MD uses premium ingredients only found (if at all) in skin creams costs hundreds of dollars an ounce. Ninety-three percent come straight from mother nature and the rest are food grade and on the FDA "Most Safe" list. Will not clog pores. Vegan. 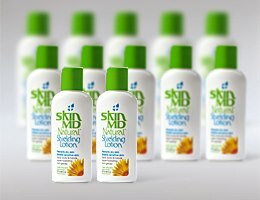 Skin MD Natural can be used under make-up and is a safe and gentle dry skin remedy for children with eczema or rashes. It is even manufactured in the USA using 100% Solar Power.